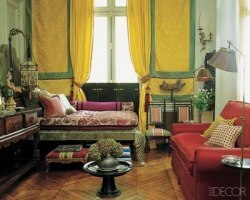 The bed featured in these two photos was designed by Emilio Terrry in the 1940s for Rose Anne Pampelonne’s Paris home. José Emilio Terry y Sánchez (1890–1969), known as Emilio Terry was a Cuban artist, interior designer, artist and landscape artist, best known for his career in France. 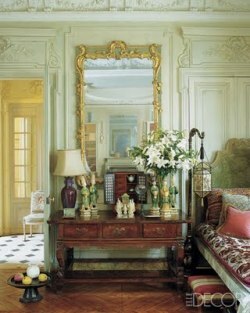 Creating furniture, tapisteries and objets d’art, he was influenced by the Château de Chenonceau, acquired by his family, and he created a style that was at once classical and baroque, which he called the “Louis XIX style”.